Heading into the midterms, our analysis at AAPI Data found 27 congressional districts in 11 states where Asian American & Pacific Islander voters could have maximum impact in 2018. We identified these districts as places where AAPIs represent at least 5 percent of eligible voters, and where the Cook Political Report had declared the race to be competitive. How did these races turn out, and can we declare that AAPIs were likely influential those races? One way to answer this question is to compare the margin of victory for the winning candidate, and compare it to the AAPI share of the voting-eligible population. Of the 27 congressional races we originally identified, 19 districts had an AAPI electorate that was larger than the margin of victory. What was remarkable about the 2018 election, however, was that there were many more competitive than originally predicted. We can now identify 18 additional races where the AAPI electorate was greater than the margin of victory. 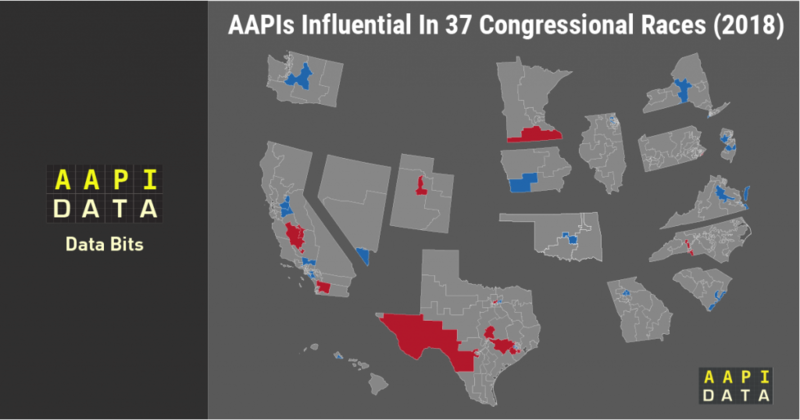 In total, AAPI voters represented a significant portion of the electorate in 37 congressional races across 17 different states. Overall, most of these districts went to Democrats (23 Democrat, 14 Republican). How about districts that flipped? Overall, as of November 20, 2018, 44 congressional seats have changed parties (37 from Rep to Dem and 7 from Dem to Rep). On average AAPIs represented about 4.5% of eligible voters in these races. The AAPI share of the electorate was more than the margin of victory in 18 of these races. OK-5: In one of the most surprising upsets of the midterms, Kendra Horn (D) defeated heavily favored Steve Russell (R) by 1.4% in a district where AAPIs make up 2.2% of eligible voters. CA-39: Republican and Korean American Young Kim lost an extremely close race to Democrat Gil Cisneros in a district where nearly 3 in 10 eligible voters is AAPI. This race was part of a historic victory for Democrats in Orange county. CA-45: Incumbent Republican Mimi Walters lost to Katie Porter in a district where 1 in 5 eligible voters is Asian American or Pacific Islander. CA-21: Filipino American TJ Cox (D) is running very close behind incumbent Republican David Valadao. TJ Cox was 1 of five Filipino American congressional candidates in 2018. In places where the AAPI share of the electorate is greater than the margin of victory, the AAPI vote was likely critical to the final outcome, and will be important again in 2020 and 2022 as incumbents seek to maintain their seats. Looking ahead, it’s likely that many of the competitive races we saw this year will remain closely contested in 2020. As Democrats look to defend their historic wins in places like Orange County, and Republicans look to win back lost seats, campaigns and party organizations will need to continue investing in AAPIs. The electoral importance of AAPI voters is not a passing phenomenon, rather it is a function of an expanded battleground map and the geographic spread of AAPIs across the country. Some readers will notice that we used the AAPI share of CVAP to estimate the number of races where AAPI voters may have made a difference and that this method overstates the AAPI vote share and thus lead to overstating the number of races. While we do not yet have official vote totals from each state, we can model the decrease in Asian vote using historical voter turnout data from 2014 and 2016. Using 2016 turnout as our baseline, the number of congressional races where AAPIs might have made a difference decreases from 37 to 25, and a 2014 baseline decreases it further to 23. However, it is worth noting that estimates of voter turnout suggest that voter turnout in 2018 was the highest of any midterm election since 1914. Data on election results comes from NYT’s House Election Results page. AAPI CVAP is calculated using the Citizen Voting Age Population (CVAP) Special Tabulation from the 2012-2016 5-Year American Community Survey. The 116th Congress Will Have The Most AAPIs. Ever.